February | 2013 | my bike. my city. my mission. As for Sans Vokal, the title explains itself. It’s my instrumental playlist but I think it is also one of the coolest ones I’ve put together mainly because there are so many different styles of instrumental music incorporated in it, from smooth jazz to flamenco to rock to soul to funk to I don’t know. Each track puts you in a place where lyrical music can’t. 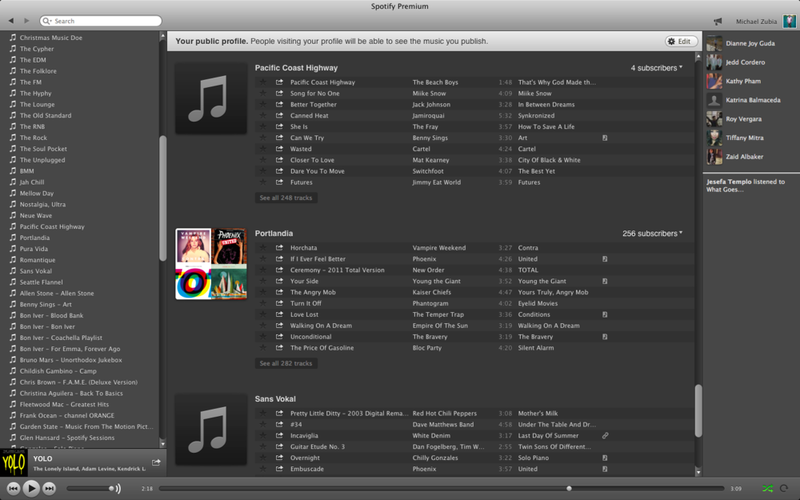 Spotify really has revolutionized how we hear music. Before you had to pay music in order to hear it or listen to it. When you’re exposed to music, the industry has to realize that you will spend your money more towards things you like – seeing them live, buying their physical/digital copies of their music regardless, their paraphernalia and their music spreads like wildfire even to people who can’t afford to buy their music. With that all said, music has such a wide audience now because you can listen to every type of music on one place. We don’t have to listen to just what’s popular but you can search such a vast directory of music until your heart is content. That’s pretty cool. It’s a great time to live in and experience. We’re given so many opinions about things and connected to the world in such a way that things don’t feel so vast anymore. I need to travel more because I find so much more about music that way, as well. It’s been a while.